Anyone that goes to sea, be it for work or pleasure, knows that only one law applies out there: the law of the sea. A fact demonstrated recently aboard Kaskazi Four, which became involved in a rescue that ended up making the headlines. 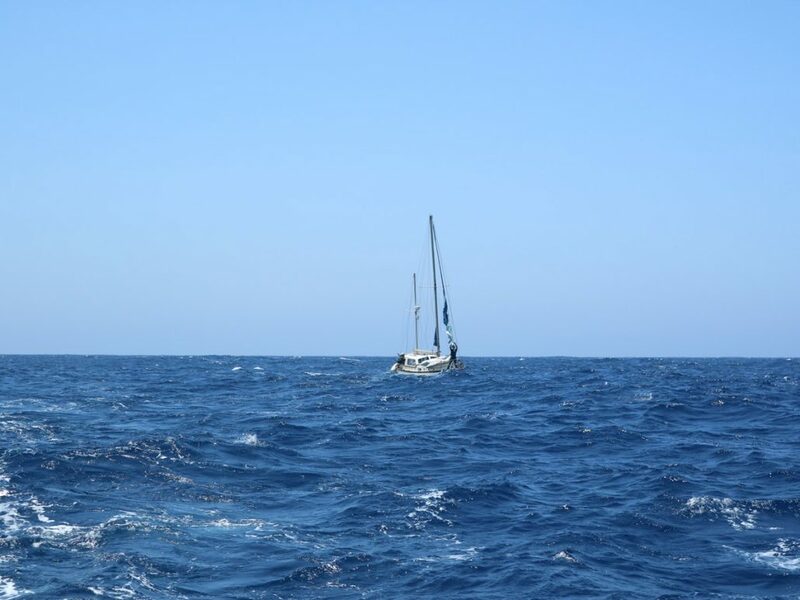 During an east-west Atlantic crossing to take her back from her winter Caribbean season to the Mediterranean’s Aeolian Islands for the summer, the catamaran’s crew caught sight of a small ketch adrift and in obvious difficulty in the commercial shipping channels off Portugal, about 200 miles out from Gibraltar. 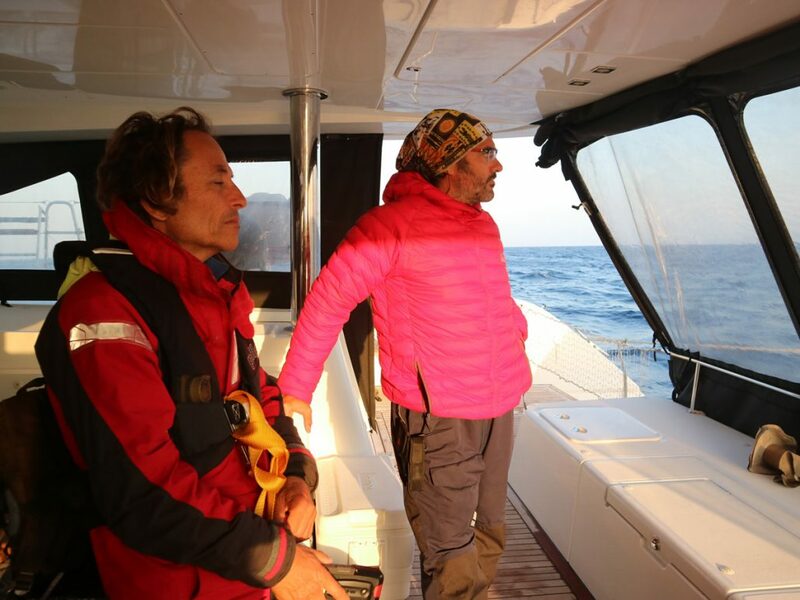 Without a second thought, Captain Francesco Rinauro and his crew made for the struggling vessel and, in a virtuoso display of skill and professionalism, brought both the confused sailor and his boat to safety. This is how the story unfolded in the words of the Kaskazi Four crew member who was on watch and first caught sight of the struggling yacht. 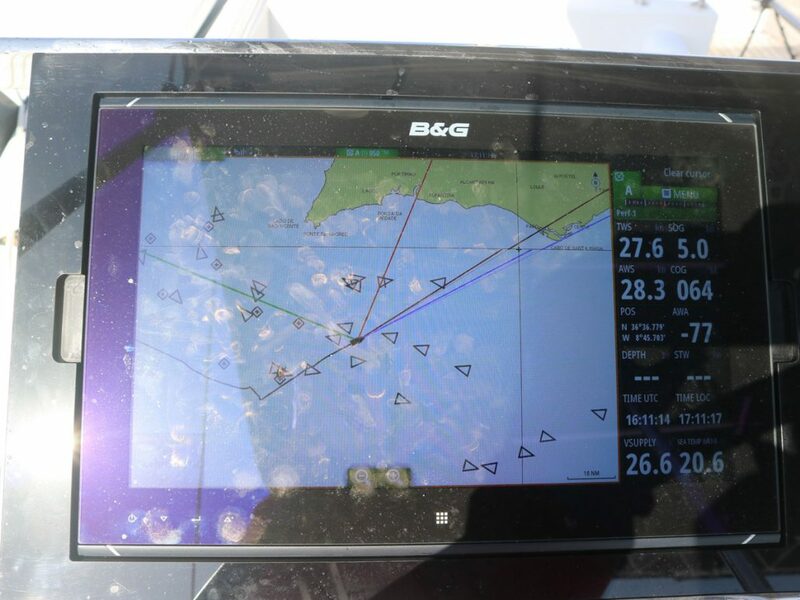 «It was dawn and as we sailed along on autopilot, I was scanning the horizon as well as keeping an eye on the instruments because we were in the compulsory commercial shipping channels for vessels sailing into Gibraltar. In other words, it’s a very tricky area with very large numbers of freighters and oil tankers going in and out so you really need to be absolutely focused. 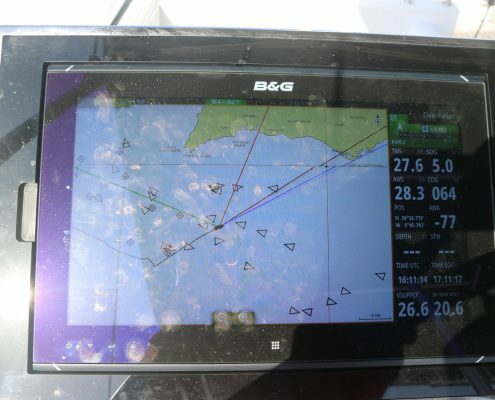 At a certain point, I caught sight of a small boat that wasn’t being picked up by the instruments – it wasn’t showing on the radar nor did it have a radio signal. I immediately realised the danger it was in because the ships’ captains don’t look out – they base their movements only on their instruments. Also, from the way the sail was moving, I realised that the boat was out of control and drifting – being borne along by the waves. So I grabbed the wheel and, on my own initiative, went to investigate. 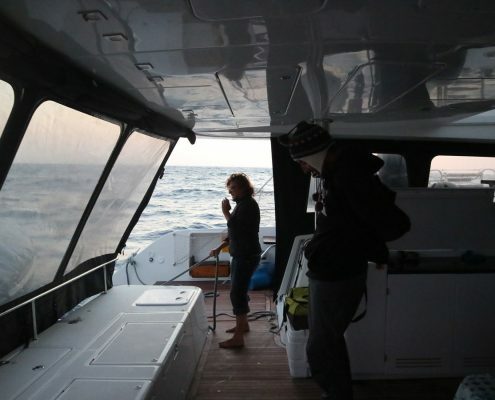 As I neared the yacht, I quickly saw that the ketch, which was around 30 foot, was in difficulty. So I woke everyone aboard Kaskazi Four and we tried to make radio contact but to no avail. When we got close enough to make ourselves heard, we noticed a man but we couldn’t make out if he was unconscious or just sleeping because he didn’t respond to us even when we shouted out to him. 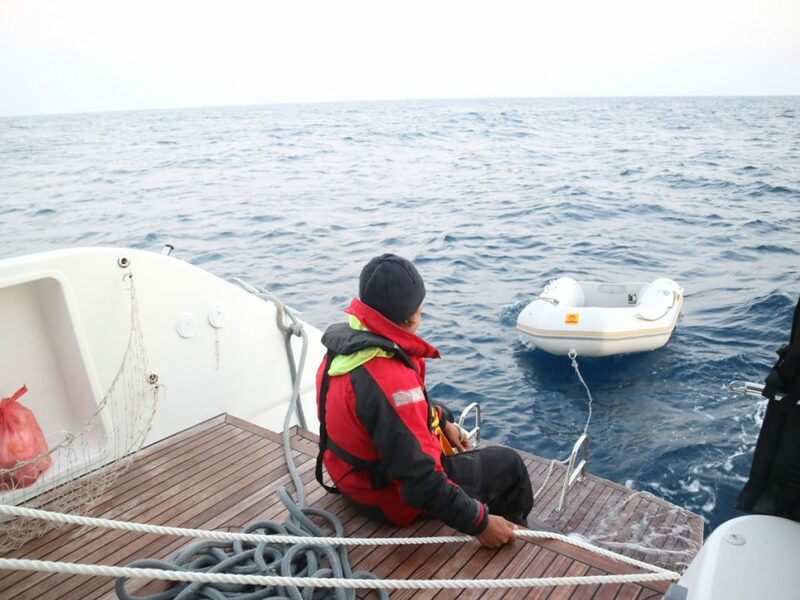 Eventually, however, he did stir and came out on deck: he looked like he was in shock and he was wearing a life jacket so he probably knew he was in a life-and-death situation and that he could end up in the water. The sail was torn and the man told us that he had neither radio nor electricity. His engine was also not working. 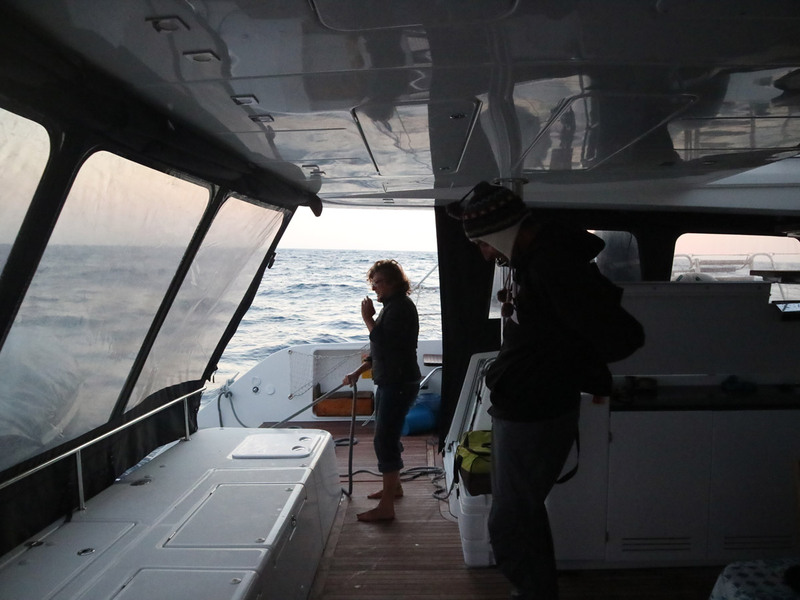 At that point, we suggested he come aboard Kaskazi, but he asked us to come aboard his boat. 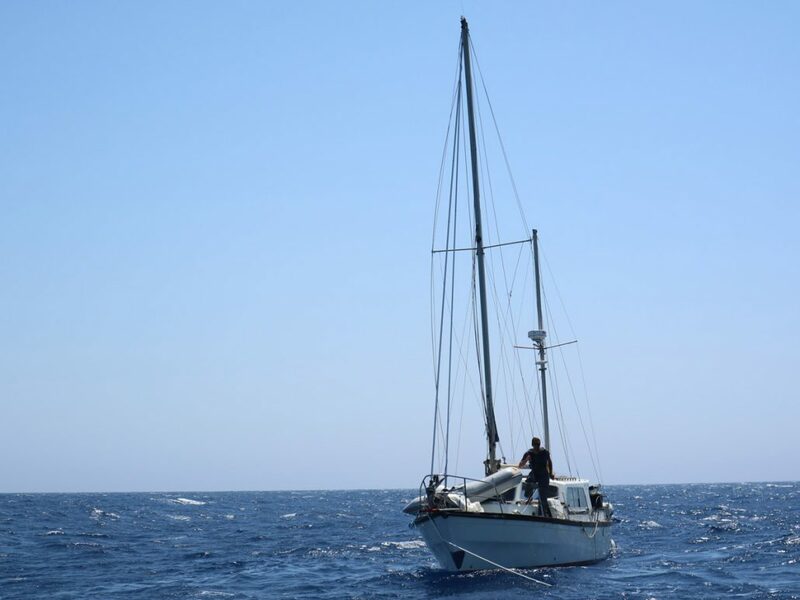 This is a very important issue in nautical procedures: there is a huge difference from a legal point of view if the shipwrecked person asks to be rescued or if the rescue is independent of his or her wishes. Luckily, we had a little dinghy aboard belonging to the captain’s son. 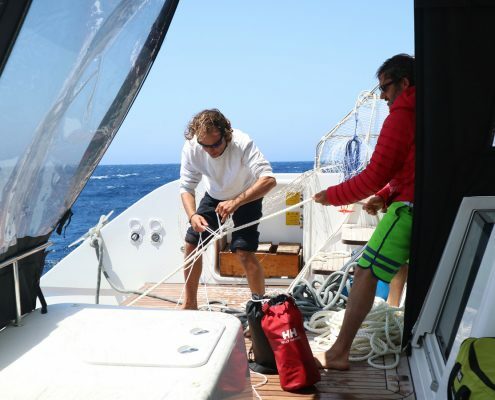 So Niko, a Croatian sailor and skipper on the crew, rowed out to him. Niko really knows what he’s doing and tried to get the engine going again but after a couple of hours, he realised it was no good. 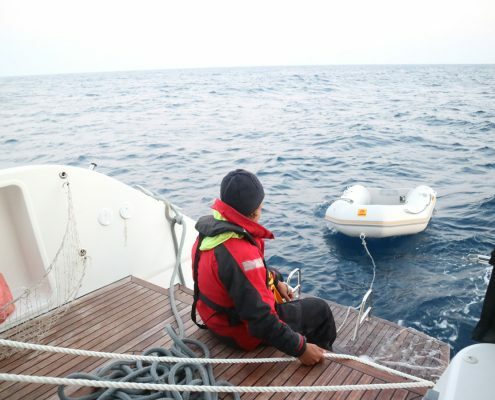 In that particular situation, the procedures stipulate the possibility of abandoning the boat but the man didn’t want to do that. At that point, the decision we had to take was far from simple: anyone that comes to the rescue of a boat in difficulty is obliged to save human lives but under no obligation regarding the boat. 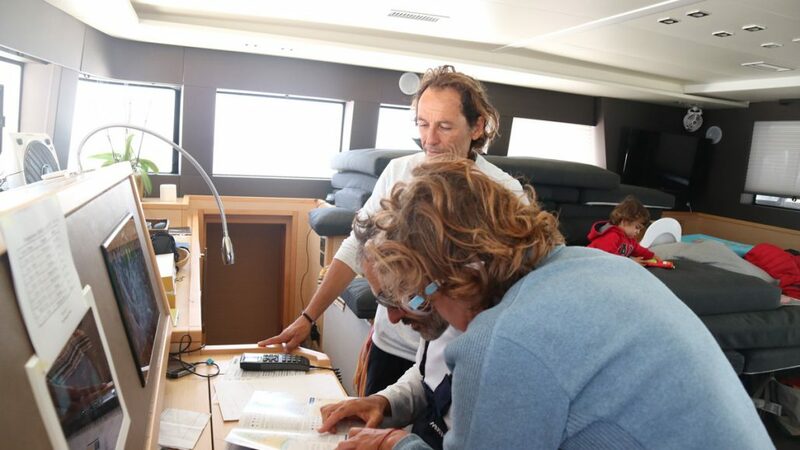 But our captain decided to take the risk and despite a 27-knot wind, a cross-sea, the ships and the fact that a whale had also shown up, we managed to secure the ketch to Kaskazi. It was a dangerous situation not just with regard to lives of the people aboard the little boat but for both vessels which might have gotten damaged. 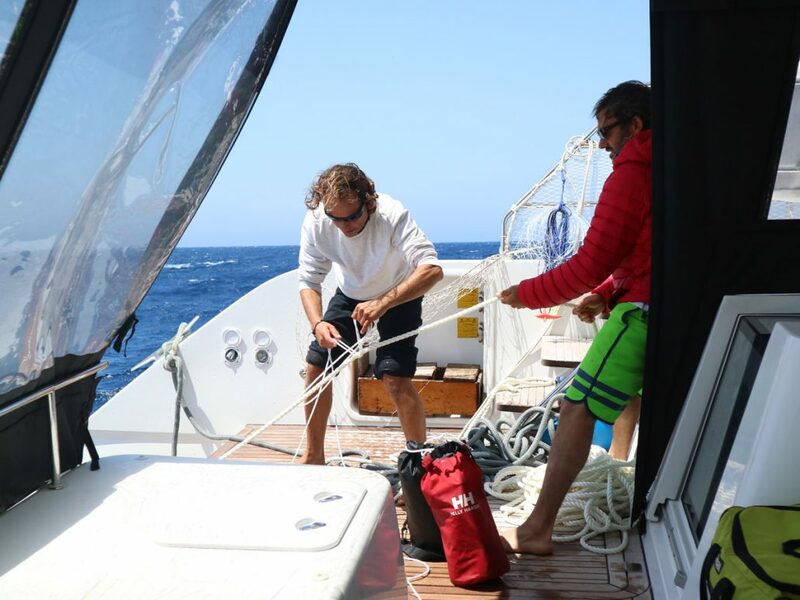 However, Kaskazi Four is a new, very well equipped catamaran and we had a very long towline aboard so we could secure the boat without risk of collision. In the meantime, our second mate Renato had joined Niko aboard to help the man who was in no condition to transfer aboard our boat in that kind of a swell. 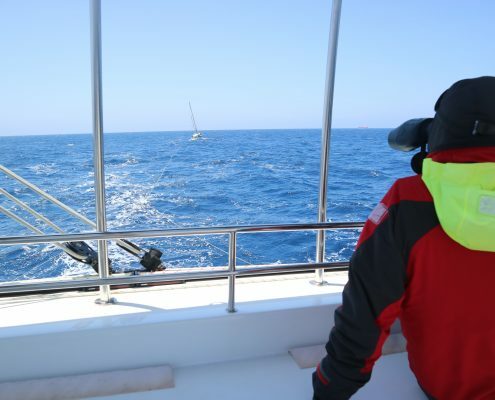 Once we began towing, we contacted the Harbour Master’s Office, the Lifeguards and Maritime Police at Portimao. We also made radio and sat phone contact with a doctor. We were very luck y to have a trained nurse aboard who helped us establish the condition of the man who had no food or water on his boat. In fact, we didn’t know how long it had been since he’d eaten or drunk. After towing the boat for 200 nautical miles, we finally got into Portimao in Portugal at around midnight where we handed the man over to the doctors and the police. 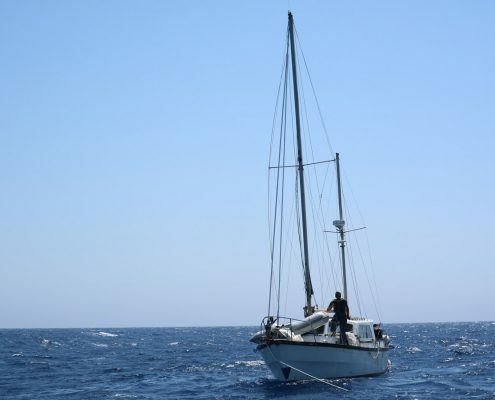 He and his boat stayed there while we cast off again the following day because Kaskazi had charters scheduled in the Aeolians and so we couldn’t hang around for long. We didn’t see the man again apart from when he was being taken ashore by the doctors but then he seemed out of it and didn’t recognise us. It was a very moving image: looking back, despite being difficult and complicated, the seafaring part was the easiest bit, thanks in great part to the skills of the people board – we’re all professionals with ‘lots of oceans under our belts’. 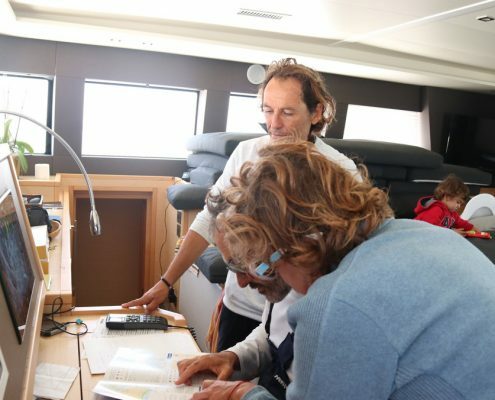 We kept a constant watch on the weather: there was wind and it was forecast to pick up so we chose a course that brought us to safer waters. 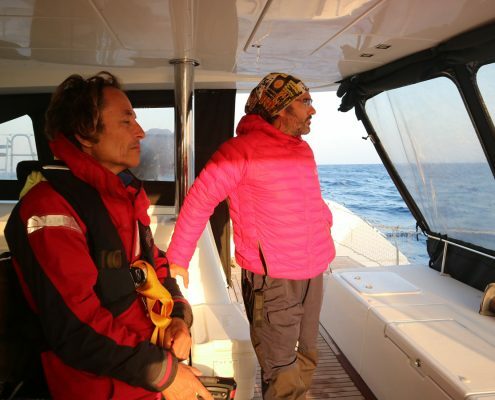 «Sometimes the sea can be very tough and so any time you see another boat in difficulty, you think that could be you. So you don’t hesitate to do anything you can to help – you put yourself in the shoes of the people that are dealing with the consequences of an adventurous life. Even ashore, people should do the same thing but generally speaking, they are less altruistic. When you get the chance to help, you do it with all your heart and afterwards you feel like a guardian angel sent help those in need. That’s how all of us aboard felt: like angels.